Food Trucks to Five Star. Discovering great food in interesting places and telling the world! Gus’s World Famous Fried Chicken, 847 W Fulton Market, Chicago, IL. Located in the West Loop with multiple locations in different cities. Short and sweet. I had chicken and only chicken….and really, thats all that matters. First bite was an OMG moment. A perfect crisp and gentle bite, sunken deep into super moist and flavorful chicken. A medium spicey heat where the chicken doesn’t get lost. You’re not wiping your brow, nor crying due to your mouth being on FIYAH! More please! Superbly done. This chicken is worth the trip. Hours: Sun-Thurs 11:oopm to 10:00pm, Fri-Sat 11:00am to 12:00am. 5 out of 5 perfect poultry points! 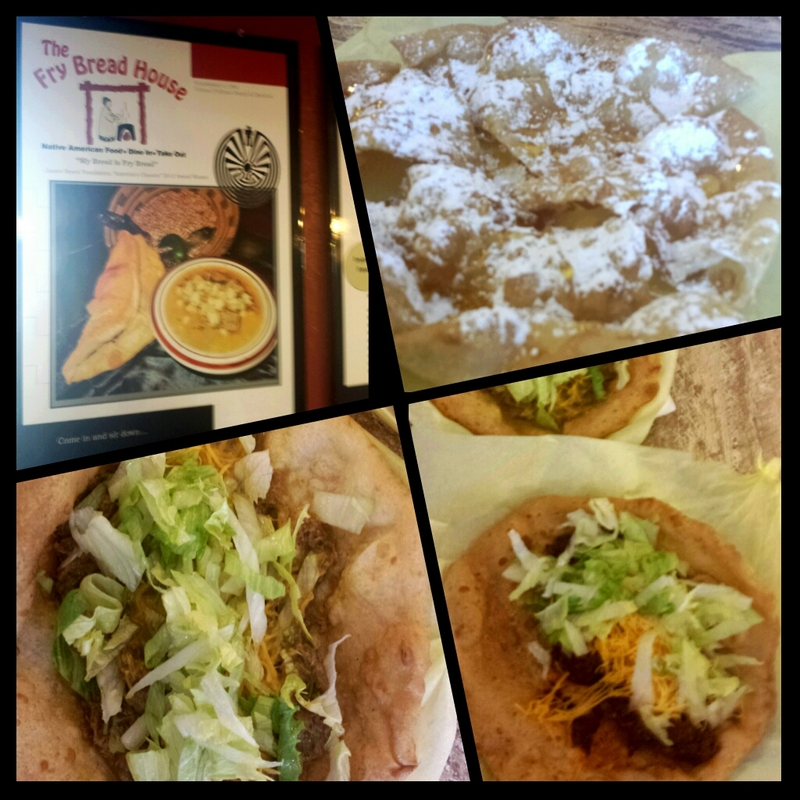 The Fry Bread House, 1003 E Indian School Rd, Phoenix, AZ. Also one location in Mesa, AZ. Fried dough. Fried bread dough! FRIED! What is not to love and admire about this?! Absolutely nothing, especially after experiencing this Native American goodness for myself! I walked in and had no idea what to order besides just fried bread. I had a feeling that no matter what I had, it was going to be spectacular. Thankfully, the sweet girl at the counter helped me along the way to make decisions. They have a nice size menu, so I appreciated the guidance. For certain, I wanted the Powdered Sugar and Honey Fry Bread ( my sweet tooth always wins), along with a couple of savory fry bread tacos to try. After ordering at the counter, you get your drinks, find a table, and patiently wait for the party about to happen in your mouth. Upon delivery, I was blown away at how gigantic these tacos were. Dang! Not your taco chain-type size. Yeow! The green chili beef taco was bursting with flavor and impressive, but wow, a bit too spicy for me. The chorizo taco was a perfect amount of spice and kick. The fry bread itself it AH-MAZ-ING! Although the fry bread tacos were huge, there was enough room for dessert, and it didn’t disappoint! Sweet but subtle. I could eat this every morning with my coffee. Really. At was an awesome finish to a freaking fantastic meal. I can’t wait to go back and try more! If you are in the Phoenix area, you MUST stop in and experience this Native American treat. Hours: Mon – Thurs 10:00am -8:00pm, Fri and Sat 10:00am – 9:00pm, CLOSED SUNDAYS. 5 out of 5 flipping great fry bread points! Cafe Benelux and Market, 346 North Broadway, Milwaukee, WI. Brunch is “the thing” to do on the weekends in Milwaukee. Brunch and Bloody Mary’s specifically. 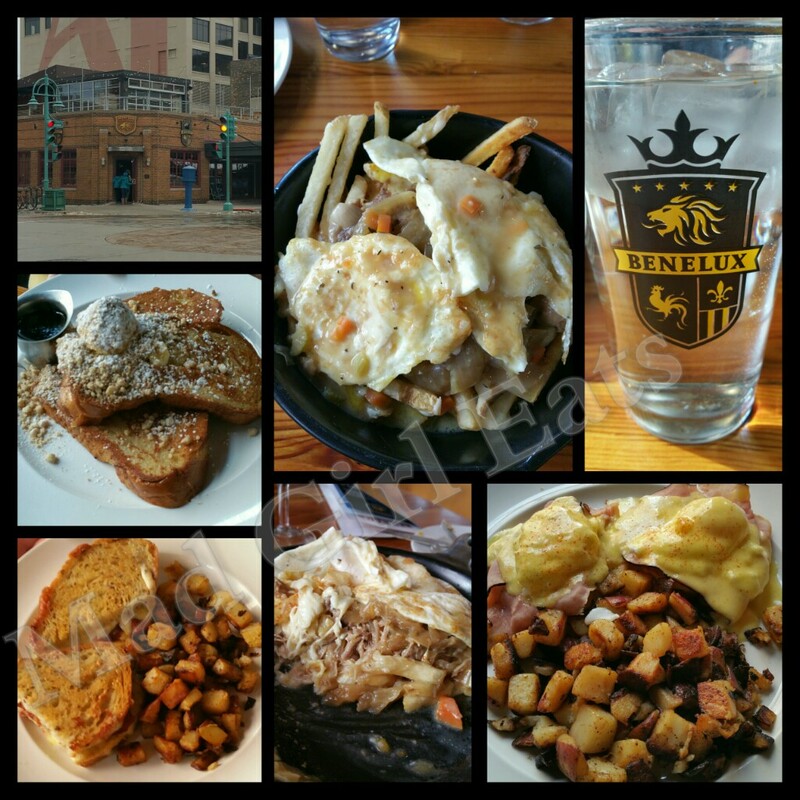 Cafe’ Benelux is one of the hot spots in downtown Milwaukee, and for good reason. The food and drinks! With a nod to European flair, the café was named after the Benelux region of Belgium, Netherlands, and Luxembourg and you can tell in the feel and the interesting menu. Beignets with Kahlua Chocolate Sauce, Monkey Bread Skillet, savory or sweet Pannenkoeken,… 7 different Bloody Marys, Mo-Mosas…ah, the list goes on. Duck Poutine Skillet caught my eye, Cinnamon Streusel French Toast, Eggs Benedict, Frites Cone, and a Kulminator Grilled Cheese would be ordered too. Top it off with a Bier-mosa, Mimosa, coffee, and you know a serious brunch is about to ensue. The drinks and Frites Cone with your choice of 2 dipping sauces arrived first. The Bleu Cheese Buttermilk Dressing and the Sriracha Ginger BBQ sauce were a dynamic match up. The traditional frites were done perfectly. Crisp on the outside, but soft inside. The Bier-mosa was a hit! Fresh squeezed orange juice, blended high-speed with bier. Refreshing! Of course, you can’t go wrong with a Mimosa and this didn’t disappoint. They also offer a Mo-mosa which is a Flemish red sour ale and champagne. I may need to try it next visit. Just in time, the entrees appear, and what a sight! The Duck Poutine Skillet, well, it was a dish of beauty. French fries, cheese curds, gravy, caramelized onions, duck confit, and topped with 2 fried eggs. Yes, pretty freaking extraordinary! Rich, savory, and every bite delicious. The Eggs Benedict was really good, but with so many other interesting choices, I should have tried the Pannenkoeken instead. The Cinnamon Streusel French Toast was the best French toast I’ve ever had. Wow, the orange marmalade gave the streusel encrusted challah bread a fantastic twist and needed citrus to balance out the richness. Add maple syrup and walla…amazeballz. To finish, the Kulminator Grilled Cheese is one to go back for. Gouda, dill Havarti, American, and Muenster cheeses on Nine grain bread weren’t enough…they had to add thick bacon and roasted tomatoes to make this sandwich a killer! A memorable spot with a cool vibe, awesome staff, eclectic and excellent food and drink. Café Benelux cannot be missed, anytime of the day or night. Hours: Monday – Thursday 7:00am – Midnight, Saturday 8:00am – 1:00am, Sunday 8:00am – Midnight. Metered street parking, area parking lots and ramps. http://cafebenelux.com View the menu, but I warn you, it will make your mouth water. 5 out of 5 points of perfectly divine eats. Peppermill Restaurant and Fireside Lounge, 2985 S Las Vegas Blvd, Las Vegas, NV. Retro cool and quirky, Peppermill is an authentic 24 hour Coffee Shop…with a full-blown lounge attached. Just south of the big action of the Strip, this restaurant offers a big menu with even bigger helpings. 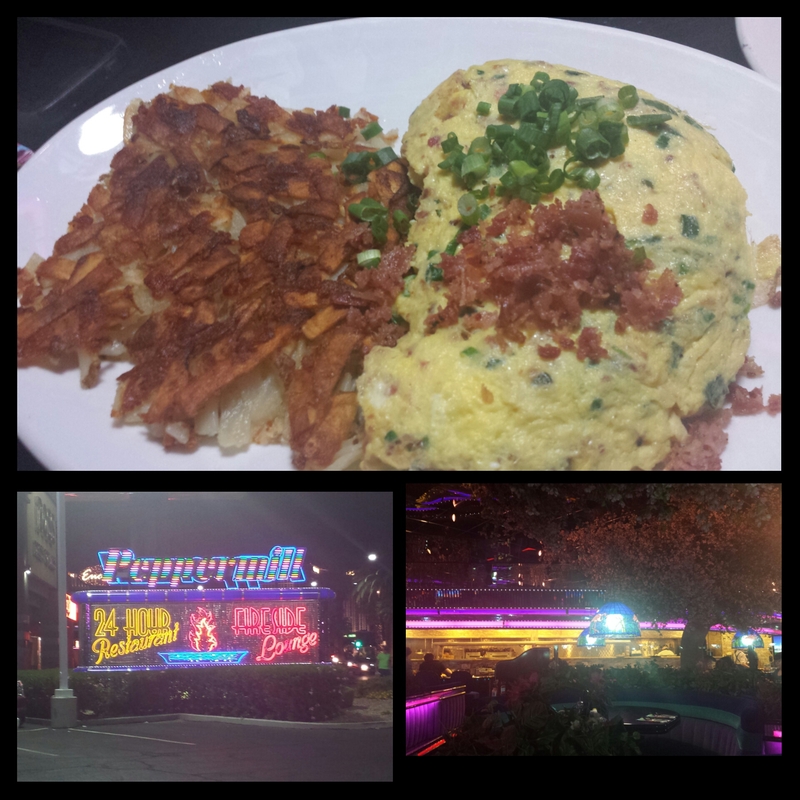 Late night/early morning dining, screams for eggs and bacon. Their omelets are gigantic, add hashbrowns and bacon and you won’t need to eat anytime soon. The dining room is like eating in a garden…. a neon jungle, cheesy garden. It was kind of….charming. The food came and it was plenty for 2 to share, bountiful and tasty. A behemoth Denver omelet, chocked full of tasty ham, gooey cheese, bright green peppers, and sharp onions. I add, S&P, with a dashy dose of hot sauce and walla, eggy perfection! Yummy hashbrowns, crispy on the outside and tender on the inside, and smokey crisp bacon. A cuppa joe with these menu choices, and all is right in Vegas. Carry on and win big! 4.75 out of 5 egg-stremely satisfying points. Mad Girl Eats Tacos El Gordo in Vegas! Tacos El Gordo on the Strip in Las Vegas. 3049 S Las Vegas Blvd, Las Vegas, NV. Found in a strip mall down the Vegas Strip from the Encore and Wynn properties, you will experience original Mexican tacos. Tacos El Gordo prides themselves on brining you fast and delicious Mexican cuisine straight out of TJ (Tijuana). Real Mexican tacos, not the American version. Deciding to try a few tacos outside of our comfort zone along with our faves. Al Pastor, Beef brain, Beef tongue, Head, and Steak. Fresh, fantastic. Don’t be afraid to try parts you normally don’t find in an Americanized taco joint. Brain, Tongue (my favorite of the “exotics” lol), Head meat. Trip your trigger, people! get the grilled veg when they ask. A delightful accompaniment. There are 3 lines for ordering, so find the correct one according to meat filling choice. A busy place, so you know it’s good. A handful of tables indoors, or covered outdoor sidewalk seating available. 4.5 out of 5 Mexican Hat Dance worthy bites. Mad Girl is Ready to Eat New Orleans! Next week starts my summer escapade around the country. First stop, New Orleans! So many places to indulge, so little time. The Joint, Commander’s Palace, Domilise, Cochon and a few others are on the long laundry list of “must try” so we’ll see where I end up! I know Cochon Butcher and Café du Monde are two return stops I will make during my 2 night/3 day visit. You just can’t say no to a delectable Pork Belly sandwich with pickled cucumber and mint from Cochon Butcher, nor can you start the day without Café du Monde’s extraordinary café au lait and beignets. I am soooo drooling right now. Getting ready to eat, shop, and party N’awlins style! Adding more restaurant recommendations to Field Trip app. Fabulous! Mad Girl Eat’s Summer Tour 2014! ~NEW ORLEANS, LA ~HOUSTON, TX ~ SAN ANTONIO, TX ~TUCSON, AZ ~ PHOENIX, AZ ~LAS VEGAS, NV ~SAN DIEGO, CA ~LOS ANGELES, CA ~SAN FRANCISCO, CA. We are still organizing the second half of this trip, but MINNEAPOLIS, MN AND CHICAGO, IL are definite. If you have any restaurant recommendations in any of these areas, I would love to hear about them! Like my motto says….Food Trucks to Five Star. If it’s a great eat, I want to know. Post them here or connect with me on Twitter @MadGirlEats. Thanks! Summer is looking pretty fine from here! Mad Girl Eats Donut King! Donut King, S. 208 Hwy 27, Minneola, FL. If you grew up with extraordinary bakeries that made pieces of heaven, called doughnuts, Donut King can’t be missed. In a world of chain supermarket bakeries and institutional tasting doughnut spots, the independent handmade doughnut shop is the king of kings. If you find yourself in Orlando, or traveling on the Florida Turnpike northwest of there, make your way to The Donut King. You will thank me when you do. Open 24/7, this little shop in the middle of a little country town, offers nothing little. Everything is big, bold, and bodacious and the choices are overwhelming! The front cases house their specialty doughnuts, gigantic and stupendous! The back shelving has their delish regular sized doughnuts we all love. So many sweet delights to choose from, where do you begin?! I start with some of my favorites. Lemon Filled, Maple Frosted, Boston Crème, Jelly Filled. Throw in a few Glazed, Snickers, Strawberry with sprinkles then top it off with an order of beignets! I took a dozen doughnuts to go, but sat and enjoyed beignets and coffee. The beignets were really good, not fluffy and flaky like most, but dense and super heavy. I didn’t care, they tasted fab! Later, I break open the doughnut box, and dive in. The first thing I noticed was how thick and generous the doughnuts were. I was also happy to have my lemon filled and jelly filled covered in glaze instead of powdered sugar. I don’t know why it’s so freakin’ hard to find glaze coated, but Donut King did it right! Oh mama, the taste was pure homemade, you could really experience it in with the fillings, especially the Boston Crème. Every bite was sensational. Every doughnut was SPECTACULAR! The name says it all, Donut KING! The doughnuts are the stars, but they also offer a nice menu if you would like a meal. Breakfast foods, New Orleans style dishes, hot dogs, wings, Castle burgers, etc. This space does have a small amount of seating and is open around the clock. These are the kind of dough delights you dream about and lust after. The doughnuts you crave, and you will. Next time I hope to snag a Red Velvet and a few ultra specialty gems. Welcome to my sugar coma….and doughnut bliss. Look for the bright blue and yellow stripe awnings. The Waterfront Restaurant and Tavern, 328 Front St South La Crosse, WI. If you find yourself on Interstate 90 in western Wisconsin or Eastern Minnesota, you need to get off of the freeway and make your way into downtown La Crosse. You will find a hidden gem on the banks of the mighty Mississippi, inside a beautiful upscale brick office complex. The Waterfront Restaurant and Tavern’s atmosphere is equal to a Manhattan fine dining establishment. White linen tablecloths, epic picture windows, gorgeous ceilings, and chic furnishings. Amazing ambiance. I visited for lunch and was happy with their diverse menu. A fine array of appetizers, a Pick Two offering, salads, sandwiches and entrees. Something to please any diner. The table order consisted of Philly Beef Baguette, Fish & Chips, and Crispy Fish Tacos. When they arrived it was a feast for the eyes…and tummy. There was no skimping on quantity or quality! The Crispy Fish Tacos, which I generally only eat in Southern California or Mexico, but these were a very nice surprise. Crispy pieces of fish were wrapped in jalapeno-cheddar tortillas, with shredded romaine, red onion, dynamite sauce, and a corn/cilantro/tomato relish served with coleslaw…which I also put on top. A burst of flavor, the dynamite sauce was just that, fiery. I recommend ordering that on the side if you’re not into big heat. The Fish & Chips were plenty. Delicate batter, seasoned fries, served with artichoke tartar sauce. Delish! Next up, the Philly Beef Baguette. It should be called Beauty and the Beef. It was an overstuffed sandwich filled with marinated pulled beef, carmelized onions, giardiniera, jack cheese, and garlic au jus to dip it in. OMGeez, a magnificent bite after bite. I highly recommend this sandwich if you love beef. My mouth is watering thinking about it. So delectable, and oh so right. The Waterfront does not disappoint. It is top-notch, easy but elegant, with incredible food and drink. I have eaten here several times and have left on Cloud 9 after every visit. I only wish it was closer. Brava to The Waterfront. Doing big things in a small city. Hours – Lunch: Mon-Fri 11:00am to 2:30pm, Dinner: Mon-Thurs 5:00pm to 9:30pm, Fri-Sat 5:00pm to 10:30pm. Tavern (gorgeous watering hole) and patio (seasonal) Mon-Thurs 11:00am to 11:00pm, Fri 11:00am to midnight, Sat 5:00pm to midnight. On street parking or parking ramp across from venue available. 5 out of 5 gemstones for this sensational hidden gem. Central Grocery, 923 Decatur St, New Orleans, LA. When visiting New Orleans, there are certain New Orleanean specialties you most definitely need to try. One of the most popular is the Muffuletta. A large round, sesame topped, almost focaccia dense ‘bun’. Inside are meats and cheeses, and an olive tapenade that sends this sandwich over the edge of righteousness. Central Grocery is home of the ORIGINAL MUFFULETTA, so why not try the sandwich where it was first created?! Ok, Central Grocery is just that, a small old- timey Italian American working grocery store. They just happen to have a sandwich counter and a table and stools in back to eat at. Order, pay, and gather your food first, then make your way towards the table, it is family style seating. There is a soda machine back there to have a drink with your meal. There were two of us, and a normal Muffuletta is gigantic, so we opted for a half order and cut that in half. It was plenty! Nice textured Italian bread, flavorful salami, ham and provolone, with their fab chunky olive salad to brighten and heighten the taste buds. A satisfying sandwich, however, I’d like a bit more meat. Many restaurants in New Orleans will offer a Muffuletta. If you’ve never had one, try the original first. Long lines form during peak season, just be patient. Their website is uber basic. Always call ahead for hours 504-523-1620. 4.25 out of 5 tasty tidbits of flavorful fun-in-a-bun.